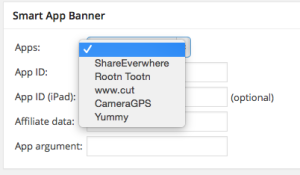 The first new release of 2015 is my Wordpress plugin, Smart App Banner. Once selected, the details are filled in. You can then customise them before saving. You can define the list of apps in the Settings menu. Editing entries here does not affect any of your existing posts, so don’t worry about experimenting and “breaking” something. It’s a small thing (that due to the “wonders” of PHP took longer than I’d have hoped to implement) but very useful I think. I hope you like it.